Vera Vasilieva: 19th June 2011 marks 8 years since the arrest of Aleksei Pichugin. Not long before this I talked with Natalia Fateeva, whom I first met at Moscow’s Khamovniki District Court, about the former chief security official at the Yukos oil company. The actress frequently came to the Court to show her support for Mikhail Khodorkovsky and Platon Lebedev during their almost two-year-long legal epic. Natalia Fateeva’s critical view of the prosecution of the former owners of Yukos is well-known. Now the actress has agreed to share her thoughts about the case of Aleksei Pichugin with me. Natalia Fateeva has been following the fate of Aleksei Pichugin for a long time on the pages of the newspapers, in books and journalists’ investigations. Last year she even personally congratulated Aleksei Pichugin on his birthday, sending a letter to him at the Black Dolphin penal colony with words of support. The actress has no faith in the court decisions by which Aleksei Pichugin was found guilty of committing serious crimes and sentenced to life imprisonment. The actress sees signs of this restoration in the extremely low level of court acquittals in our country, one of the lowest in the world. In her words, the innocent in our country are often found guilty, even when, unlike the Yukos case, no high politics is involved. People simple are sacrificed for the sake of ‘good’ statistics for solving crimes. Natalia Fateeva calls the case against Aleksei Pichugin trumped up and fabricated. Natalia Fateeva believes the reasons why this legal outrage has become possible lies in the mercantilism and indifference of society, the roots of which go back to Soviet times. Then benefits of every kind – foreign trips and so on – were only accessible to those who participated in social life and said in public the things that were required ‘from on high’. And these had little in common with people’s real convictions. Now these traditions are being resurrected. “The creative intelligentsia continues to live by the laws of Soviet society and acts out of self-interest. I do not like this very much. Of course, no one owes anything to anyone, but people must realize the injustice and lawlessness that is going on. I don’t think of myself as an active fighter, but I cannot keep quiet when I see what is happening. It is impossible to live in a country like this. 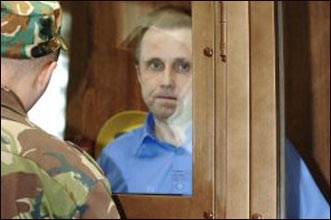 Aleksei Pichugin was arrested on 19 June 2003. At his first trial on 30 March 2005 he was convicted of the murder of Tambov entrepreneurs Olga and Sergei Gorin by Judge Natalia Olikhver sitting in Moscow City Court. This was despite the fact that even the bodies of the supposed victims were never found. The chief, and perhaps the only, witness for the prosecution was the convicted criminal Igor Korovnikov, sentenced in 2000 to life in prison for committing serious crimes of a sexual nature, including crimes against minors. The life sentence in the second case, concerning the organization of the murders of the mayor of Nefteyugansk Vladimir Petukhov and director of the Moscow trading company Phoenix Valentina Korneeva, and also attempts on the life of the director of the East Petroleum Handels company, Evgeny Rybin, was handed down to Aleksei Pichugin on 6 August 2007 in Moscow City Court by Judge Peter Shtunder. Witnesses for the prosecution gave evidence based on hearsay. Subsequently one of them, the prisoner Gennady Tsigelnik, admitted that he had helped to frame Aleksei Pichugin and Yukos vice-president Leonid Nevzlin at the request of investigators of the General Prosecutor’s Office who had promised him in return a minimum term in prison. But they had deceived him. The second witness for the prosecution, Evgeny Reshetnikov, has also said that he first learned of the version according to which Yukos was involved in the crimes from the investigators. Lawyers for Aleksei Pichugin have made two applications to the European Court of Human Rights for violations of his rights committed during the first and second criminal cases against him respectively. The first application passed through the stage of ‘communication’ in 2007. This means that the European Court of Human Rights has recognized the application as admissible, submitted questions to the representatives of the Russian government and to the lawyers acting for Aleksei Pichugin, and has received answers to these questions. The second application to the European Court of Human Rights, on the second criminal case against Aleksei Pichugin, was submitted in 2007 and is still awaiting the stage of communication. According to Aleksei Pichugin’s lawyers, during the initial investigation his rights were violated in relation to three articles of the European Convention for the Protection of Human Rights and Fundamental Freedoms: Article 3 (prohibition of torture), Article 5 (unlawful detention) and Article 6 (right to fair trial). For more information about the case of Aleksei Pichugin, see here. Aleksei Pichugin refused to give false testimony against the managers of the Yukos oil company. This, according to evidence given by Aleksei Pichugin himself, is what officials of the General Prosecutor’s Office on a number of occasions sought to obtain from him. In particular, these officials were investigator Aleksandr Bannikov and prosecutor Kamil Kashaev, who threatened Aleksei Pichugin with life imprisonment if he refused to comply. At the present time Aleksei Pichugin is held in Penal Colony No. 6, a special regime colony for life prisoners, also known under the unofficial name of the Black Dolphin. On 25 July Aleksei Pichugin will be 49. For several years now Aleksei’s sympathisers have run an Internet campaign to gather birthday wishes for him. Letters of support for Aleksei Pichugin can be sent to the following address: Aleksei Vladimirovich Pichugin, Penal Colony No. 6, Building No. 6, Sovetskaya Street, Sol-Iletsk, Orenburg Region, 461505. In Russian: 461505, Оренбургская обл., г. Соль-Илецк, ул. Советская, д. 6, ФБУ ИК-6. Пичугину Алексею Владимировичу.